Sepp Blatter has been suspended for 90 days by the FIFA ethics committee. March 10, 1936 – Born in Visp, Switzerland. 1948-1971 – Player in Swiss amateur league. 1956 – Becomes member of Swiss Association of Sportswriters. 1959-1964 – Public relations official for tourism in the canton of Valais. 1964-1966 – Secretary general, Swiss Ice Hockey Federation. 1968-1975 – Director at watch company Longines S.A.
1975-1981 – FIFA technical director. 1981-1998 – FIFA general secretary. 1998 – Elected FIFA president. 2002 – Blatter accused of financial mismanagement by FIFA executive committee members. 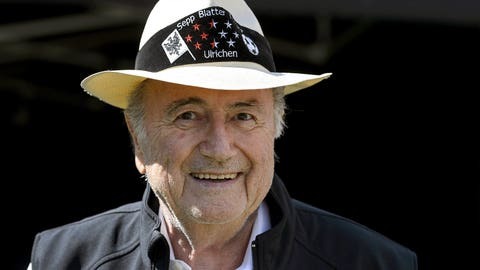 Criminal complaint filed against Blatter with Swiss prosecutors comes to nothing after Blatter is re-elected by beating Issa Hayatou of Cameroon in a vote. 2011 – Re-elected unopposed after challenger Mohamed bin Hammam, a former ally, withdrew before being suspended by FIFA over bribery allegations. May 29, 2015 – Reneging on pledge not to stand again, re-elected for fifth term by beating Prince Ali bin al-Hussein. June 2 – Announces resignation plans as pressure mounts over escalating criminal investigations. July 20 – Exit date set for Feb. 26, when the presidential election is due to be held. Sept. 25 – Interrogated by Swiss federal police over alleged criminal use of FIFA money as office is searched and data is seized. Oct. 8 – Suspended for 90 days by the FIFA ethics committee.